Sometimes, you just want soup. There's something about autumn that makes me want to cook again. I get a little over it during the summer. I feel like I have to grill all the time, but being a charcoal-loving family, it can be a little bit of a hassle to start the grill up every day. By mid-July, I just want to eat sandwiches or salads that don't involve cooking, and get on to other activities. But come late September, when the chill hits the air, my mind turns to roasts, stews, casseroles, baked goods, and most of all soup. I love soup, and I love making it from scratch. There's nothing better than chicken soup that started from some kitchen scraps and a whole bird. It is somehow satisfying, not just to eat, but to make. It makes your house smell amazing. And to watch such humble ingredients turn into something so wonderful, so versatile, so useful as stock, is a thing of beauty. Stock is an all day proposition in my kitchen. I make a huge stock pot full of it, using two or three chickens. It takes at least an hour for that pot to come to a boil, and then it simmers for a couple of hours before I remove the birds, separate the meat from the skin and bones, and throw the bones back in for another few hours. Then there's the straining, the rapid cooling in an ice bath, and the overnight chilling. The next day, I can pretty much lift the fat off in one or two pieces, and I am left with a slightly gelatinous stock that is richly flavored, unsalted (store-bought stock has loads of sodium, so whenever you buy it, get the low sodium kind and add your own salt as needed! ), and satisfying...if for no other reason than that it is cheap. Usually, I'll use a gallon of it for soup that night. 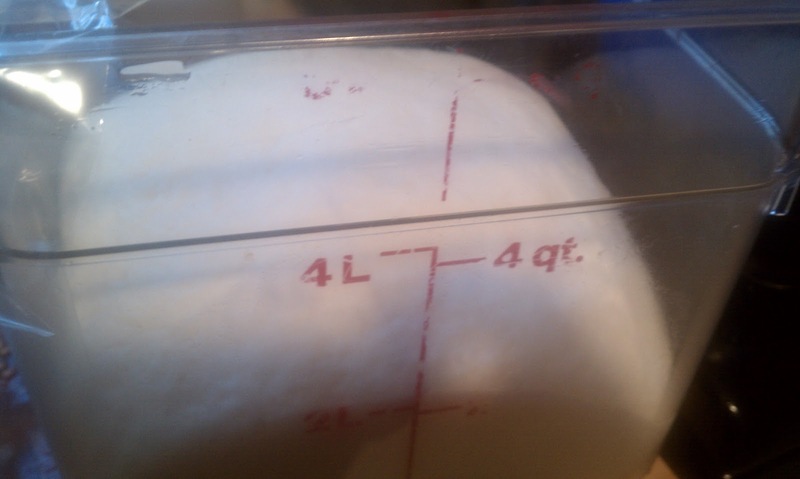 The rest of it gets poured into freezer containers and stored away in the deep freeze for later use. Plus, I get all the meat from the birds. I use some of it for the soup, and put the rest into freezer bags to use in casseroles and such. I love it. Maybe that makes me weird. But I love the process. I am not always in the mood for the process. Maybe things are busy. Maybe my mind is on other things. Maybe I am just plain tired. But I still have to get dinner on the table, and I still just want soup. Brown some ground beef in a dutch oven. Push the meat to one side, tilt the pot in the other direction, and spoon off most of the fat. 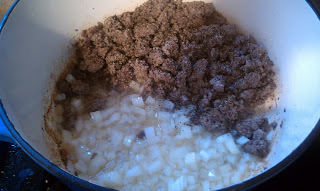 Add a diced onion and cook until softened. Sprinkle with salt (I use Morton's Kosher salt), pepper and garlic powder (not garlic salt!) By the way, any time that I use ground beef, I alway cook an onion with it. And I always season it with salt, pepper and garlic powder. You might not think it makes such a difference with all the other things that you add to the dish, but it really does! You should always season your meat, and brown it well, until there are some dark spots on the pan and on the meat. See the brown stuff around the edges of the pot below? That's caramelization, and it's going to basically melt into the soup. That's how you can get great flavor out of something as humble as hamburger. 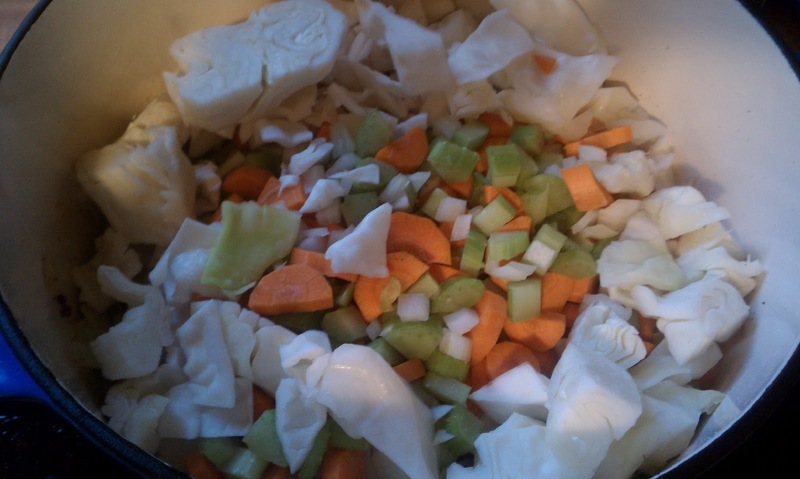 Once the onion is softened, throw in 2 cups each of diced carrots, celery, and cabbage. 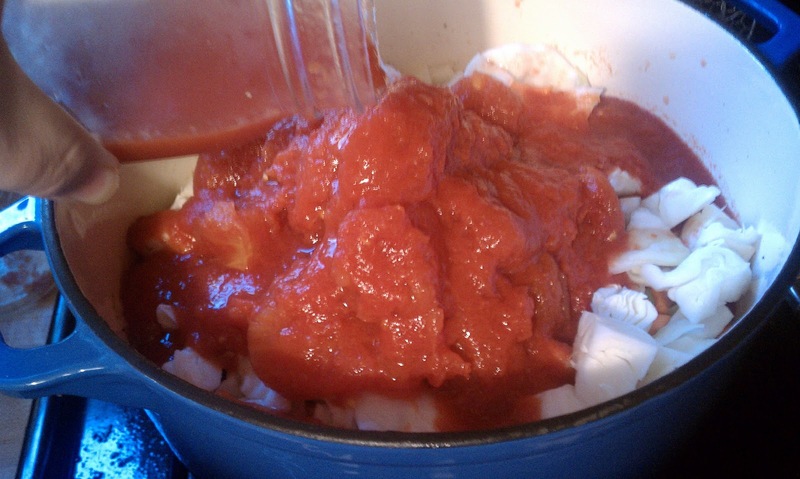 Now pour in a 28 oz can of tomatoes (whole, diced, whatever you have on hand), or a quart of home-canned tomatoes. Don't worry about the large pieces. They will get very soft after simmering for a while, and then you can easily crush them by pressing them against the side of the pot with a spoon. Add a 28 oz can of tomato puree or tomato sauce, or again, a quart of home canned sauce. At this point, fill up the tomato cans or jars about 3/4 of the way full with water. Swish it around and pour it into the pot. That way you get all the tomato residue, and your cans are ready for the recycle bin. 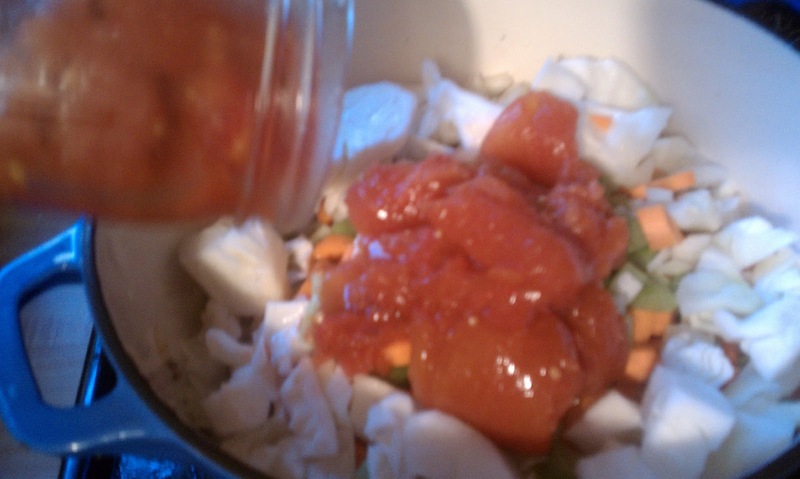 Add 8 bouillon cubes. Yes, that's a lot, but this is about 6 quarts of soup. However, because bouillon is largely salt, you'll want to hold off on adding any more salt until things have melded and you can see how it tastes. Now add a teaspoon each of dried thyme and basil. Stir it all around and bring it up to a bare boil, then turn it down to a simmer and walk away for a while. One of the great things about soups is how forgiving they are. Seriously, if you walk away for an hour, it will be ready. If you get busy and let it go for a few hours, all you will probably have to do is add a little water now and then to compensate for what has cooked off. I often get soup going before I go to pick up my kids from school, and let it simmer over low heat on the stove. That way, dinner is just about done, and I am free to help with homework, nag about chores, or throw together some bread dough! And that's about it! Once you are just about ready for dinner, just give the broth a quick taste and adjust the seasonings as needed. And feel free to play with it a little. 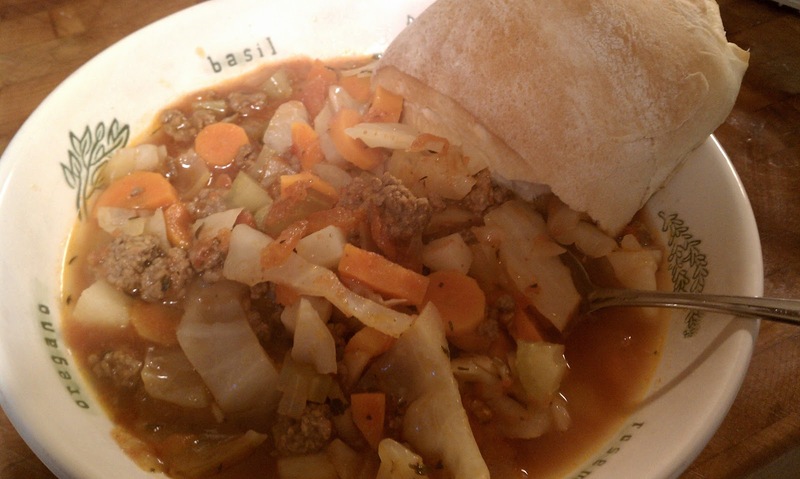 Add any other veggies that you think may taste good. I sometimes add zucchini, and I tell you, it tastes an awful lot like the peasant soup you can get at Olga's. Comfort food doesn't have to be an all day affair. Enjoy!